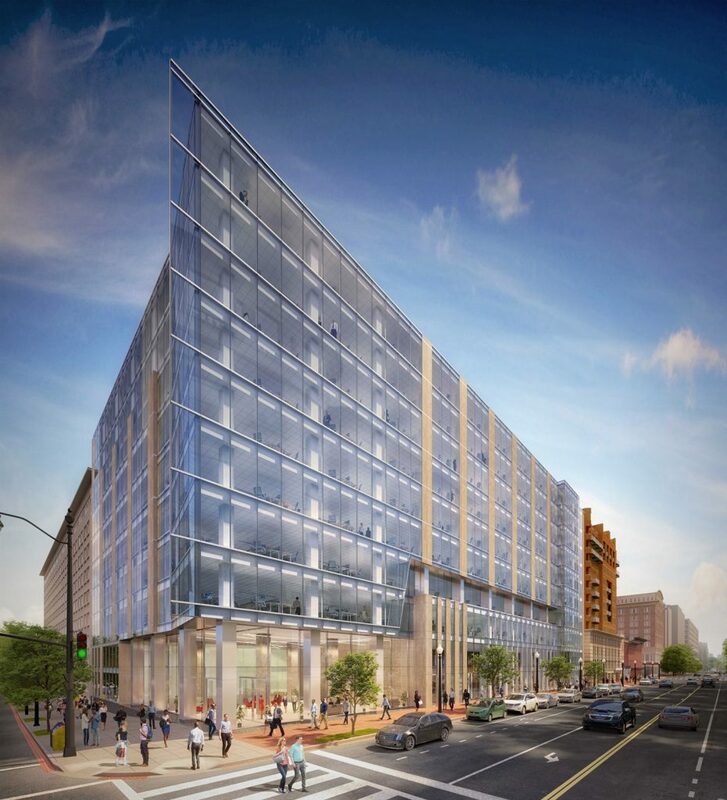 October 2, 2018 | Washington D.C.
A 1970s-era office building near Capital One Arena is being primed for what could be a major makeover after losing the Department of Justice as its long-time anchor tenant. The federal agency moved out of 600 E St. NW as part of a larger consolidation in NoMa, shedding more than 1 million square feet across four buildings for nearly 840,000 square feet at Three and Four Constitution Square. That has forced the landlords on the losing end of that migration to take a hard look at the future of their aging office buildings, many for the first time in decades. Such is the case at the southwest corner of Sixth and E streets, where S.C. Herman & Associates is nearing the point where it will need to make a choice: A more modest improvements to its roughly 340,000-squarefoot, red brick building at 600 E or a more exhaustive overhaul to convert the 10-story structure into trophy-class office with a new glass facade. The District-based developer has retained Stream Realty Partners to pitch the two scenarios, with market demand to help determine which of the two paths it will take. S.C. Herman has retained DEP Designs, which also helped it come up with new designs for 1441 L St. NW after losing another federal agency there. A more intensive renovation could boost rental rates by $10 per square foot or more, with gross rental rates in the mid-to-upper $60s under the more intensive scenario, Pacinelli said. Even under the less-intensive scenario, the building to be branded as Penn Quarter Place will still benefit from planned upgrades including a new, two-story corner lobby, private rooftop space, new fitness center and secured bicycle storage. S.C. Herman isn’t alone. Tishman Speyer is also considering conversion to trophy office at 601 D St. NW once the Justice Department moves out early next year, and the owners of 1425 New York Ave. NW and 1331 Pennsylvania Ave. NW will be left with similar choices. Part of the question is whether those landlords should target federal agencies or private companies with larger budgets to spend on high-end space. That will depend on a number of factors including the location and condition of the buildings, said federal leasing expert Darian LeBlanc, a vice chairman at Cushman & Wakefield. The New York Avenue property, for example, is a mid-block building near the White House, making the building an easier sell to replacement federal tenants. Either way, he said, the faster those buildings lease up, the better for the larger community of federal agency landlords. “The whole market should be rooting for those guys, because the one thing we don’t need or want is more space put back on the market that just sits there,” LeBlanc said.